Since posting about Baltimore album quilts, I’ve been working on preparation for a course I’ll be teaching in the fall. I wouldn’t call it teaching, but that’s how the folks at Elderhostel refer to it. We have our own Elderhostel Lifelong Learning Institute here at Charlestown, and during its first year, over 800 people enrolled in courses that were offered. Most of them were taught by residents and staff. 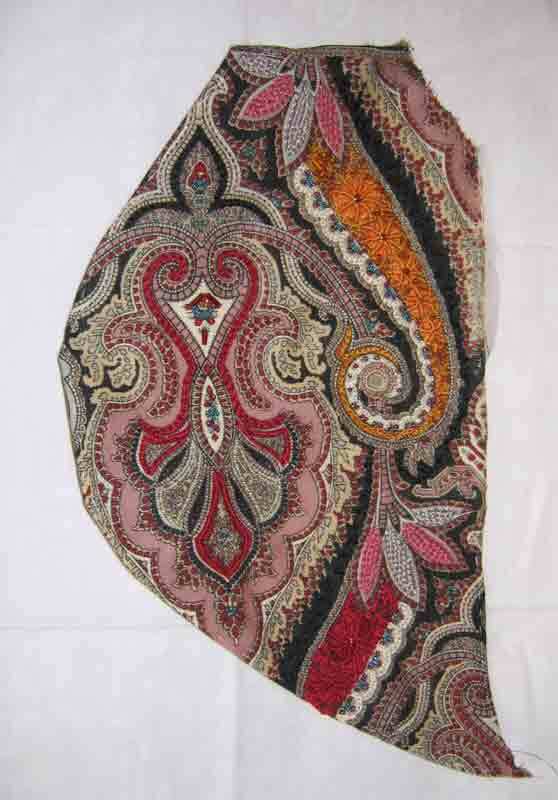 For the next semester, I volunteered to do a show-and-tell based on the fabric art of Esther Nisenthal Krinitz. You can see her extraordinary art here. Following is the course description I wrote for the catalog. I will project the photograph of one of her works, followed by some shots of details. I’ll read her own words, telling the story of each work, and I’ll talk about how she created each one. I have a book written by her daughter with lots more information about Esther to add to my careful study of her work. The CD of photographs I have does not show the photographs in the sequence I want to use. Consequently, it’s taking a lot of time to practice getting the right photograph on the screen when I want it. And writing my script is also time-consuming. Do go look at Esther’s fabric art. You will be astonished and moved. How could she create such life-affirming, joyful works of art, having survived the horrors of the Holocaust? Meanwhile, I have been doing restoration work on an old Romanian embroidered pillow cover belonging to my daughter-in-law Karin. More about that when my camera comes back from being repaired. Again I say, my physics study is on hold. My Elizabethan embroidery practice is on hold. I felt compelled to respond to a message from grandson Luke about comparative religions. Very few, if any of you, will be interested in this response, but here it is for any who are interested. I sent him this introduction to a video I made showing him books that have been important to me on my spiritual journey. Warning: the two-part video is nearly half an hour long. I have been motivated to study comparative religions at two critical junctures in my life: first, in the 1960s when I was rejecting the church in which I had been brought up, and second, when I succumbed to this neurological disorder I’ve had since 1992. At college in the mid-60s, I took a Comparative Religions course with a dull and uninspiring professor, near his retirement. Although his course focused on the exoteric forms of world religions—Zoroastrianism, Islam, Hinduism, Buddhism, Judaism, and Christianity, and his lectures were boring, I went far beyond the syllabus and read not only about the religions, but also their sacred writings. I reached the conclusion that, despite differences in beliefs, practices, customs, and other cultural baggage, all these religions had developed in the same way: A great, spiritually enlightened individual taught what he knew (always men, of course, although there have been highly enlightened women throughout history) and disciples and students gathered around him. Understanding only part of his teaching and often lacking his direct personal experience of Spirit, they became teachers themselves. Their students understood only part of what this first generation of teachers taught, and so on. In every religion, certain elements were written and accorded status as divinely-inspired truth, and certain rituals became orthodox, required of adherents. Germs of the original insights of the first teacher were contained in all of these religions, but the institutions that grew around them were more political and social than deeply spiritual. At the same time, I met William Blake, who has been my most influential spiritual teacher. I hope you will get around to reading my essay, “Why Blake is Important to Me”, because it is mainly the story of my spiritual journey. It’s also better written and more interesting than my old college papers. The following 30 years after college were filled with career, family, and civic activities. In the 1980s, the New Age at its height, I read a lot of spiritual books, many of not much value. But I also encountered Buddhism in living practitioners and writers, as well as shamanism and feminist spirituality. I even participated in a Christian-Buddhist Meditation Conference in Boulder in 1984 or’85. But I did not sustain any religious or spiritual studies or practices. Only after I was forced to retire and live in seclusion in 1993 did I begin intense and serious searching for a spiritual path I could adopt. I read many, many more books than I now own or can remember. Twice I have had to downsize my library for space reasons, and lost lots of books in that way. Without income, I depended mainly on the library for books, taking copious notes before returning them, buying only those I couldn’t find through Inter-Library Loan and those I felt I had to have for reference. I continue this practice now—borrowing a book from the library before deciding whether I want to own it. The books I will show you are only a selection of the books I own, and the books I own are a small fraction of those I’ve read. I think Huston Smith’s books are among the best on world religions. Among the religious traditions I have learned about that are not represented in my library are shamanism, voudon (a syncretism of Roman Catholicism and African practices developed in the Afro-Caribbean, especially Haiti, vulgarly known as voodoo), African, and Native American ones. Of these last I most remember Black Elk Speaks: Being the Life Story of a Holy Man of the Oglala Sioux and Buffalo Woman Comes Singing, by a contemporary woman, Brooke Medicine Eagle. It was Geoff who first got me interested in Buddhism, after he spent several months in India, at a meditation retreat, and Nepal; and it was Geoff who introduced me to shamanism and voudon, both of which involve drumming. I have also spent three years as a student of Rosicrucianism, a once-heretical form of esoteric Christianity from the 16th century. I know nothing at all about shintoism. Not an adherent of any religion, I think of myself as a contemplative. I walk my own path. Still, I am greatly influenced in my own practice by Buddhist teachings and by the Bible and the Christian tradition. Not only was I brought up in a practicing Christian family, but our Western culture is shaped by and permeated by Judeo-Christian thinking, as well as Greco-Roman. Both our arts and sciences are deeply rooted in Christian soil and Christian mindset. And now to some of the books that have most influenced me. How shall I begin? The lost gospels were found in Egypt as part of the Nag Hammadi Library, scrolls preserved in clay pots. Martin Buber was a Hasidic Jew. Bede Griffiths was a Roman Catholic monk. Thomas Merton wrote his Master’s thesis on William Blake. I should have said that Joseph Campbell speculated that the development of humankind may be going in the direction of individual, personal, spiritual practice, rather than depending on organized religions for spiritual life. In my last post, I promised I’d get back to writing about stitching, and here I am. Without delay, here’s what I’m going to make. This is a panel designed and taught by Jane Zimmerman. You can find out more about her chartpak for this piece here. I learned about it from my friend Megan, who is working an Elizabethan design of her own. Do go see her blog. Not only does she show her own work, she also gives us the benefit of her research. There’s lots to learn and enjoy there. Now for the back story. (If you’re not interested, just scroll down to the line of asterisks.) 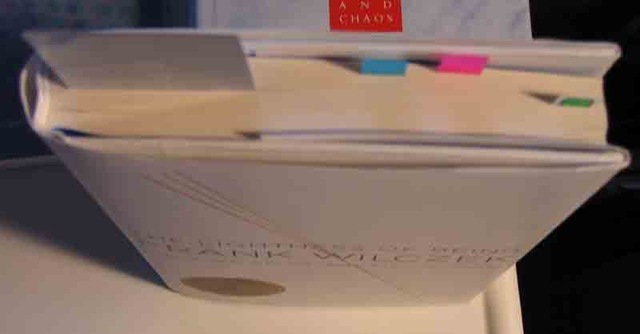 When I told Megan that I had bought Jane’s chartpak and planned to work it, she asked, “Does this mean that you’ve finished or nearly finished with physics?” Not hardly. What I’ve found is that this study and writing an essay about it is going to take many more months. It is hard going, but very compelling. I keep finding more books to read, more online sites to visit, and I have to re-read almost everything, sometimes several times. So this is a much more time-consuming project than I envisioned last October, when I thought I’d take a couple of months off from stitching to do it. Here’s a video about the books I’m working with now. 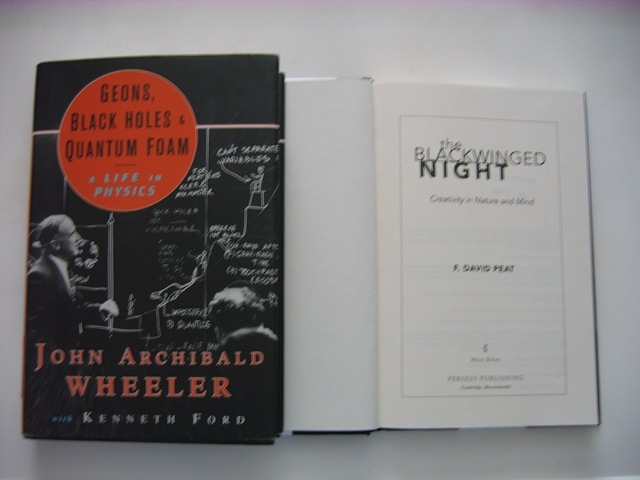 In addition to these books, I have read and returned to the library Peat’s Blackwinged Night, about creativity in nature as well as in us; and John Wheeler’s autobiographical account of his life in theoretical physics, Geons, Black Holes, and Quantum Foam. The reason why this project is taking so much time is because I want to be able to write simply and briefly about my understanding of current mainstream fundamental physics. To write simply and briefly is much harder than writing at length everything I’ve learned. To do it, I have to have a good understanding myself, so I know how I can simplify and what I can leave out, and still make a coherent argument. So far, I’ve written and printed out 23 pages, about half of which is a first draft and the rest is notes and quotes. Now, back to stitching. Well, I just can’t go for most of the year without making anything. So I decided I’d embark on my long-delayed Elizabethan project. 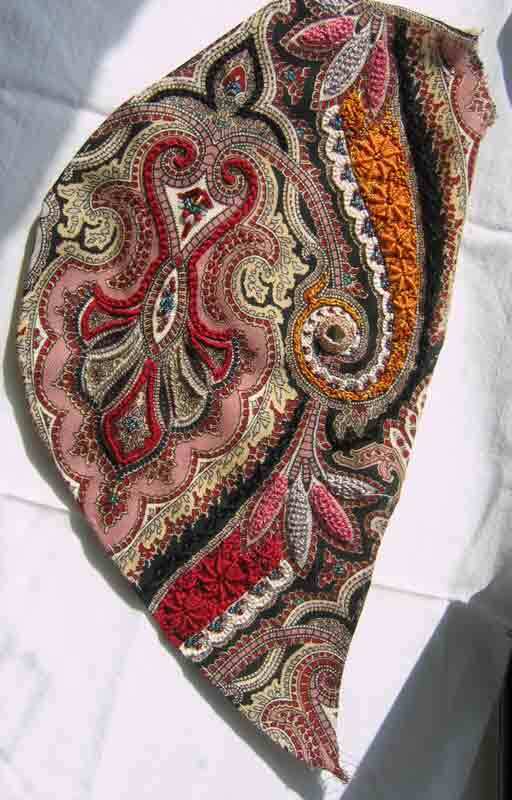 My plan is to create my own contemporary design using Elizabethan stitches, threads, and colors. When I saw Jane Zimmerman’s chartpak offered, I thought that would be a good way to learn and practice the stitches. Just meet her specifications for materials. Just follow the instructions. No brainer. No decisions. You may remember that I’ve been planning to work on Elizabethan needlework for some time. Three years, in fact. I’ve collected books. These two include designs as well as stitch instructions. This is a design I bought online. And this is Jane Lemon’s old but wonderful book, which I’ve had for a long time. It includes Elizabethan goldwork. I also have The Embroiderers’ Story, by Thomasina Beck, that includes a lengthy chapter with lots of illustrations, on Elizabethan needlework. I’ve borrowed books from the library on Elizabethan embroidery, too, such as George Wingfield Digby’s classic text, Elizabethan Embroidery, based on the textile collection at the Victoria and Albert Museum, where he was Keeper of Textiles. What’s more, I’ve had Jane Zimmerman’s book, which includes instructions for the same panel, though much less detailed than the chartpak and no color. It is 24 pages long and it has excellent close-up color photographs of each motif. There is 32-count linen, Needlepoint Silk, Kreinik gold paillettes (these I already owned but I bought more), and Kreinik very fine #4 gold braid. They had to order the fine #8 gold braid and the paillettes for me. When I bought these paillettes about ten years ago, a gram cost a couple of dollars. Now half a gram costs $4.50. Though I was shocked that Jane called for metallic thread rather than gold metal threads, I’m glad she did. I don’t want to think what the real gold for this design would cost. I’m actually disappointed in the Needlepoint Silk. The colors are lovely, but the threads have a matte finish. I like using silk floss that is more lustrous, that catches the light. Here I show you the silk floss I’ve been using with a skein of Needlepoint Silk. See the sheen on the ivory thread? That’s Eterna, Chinese pure silk floss. It costs $1.05 for five meters. The pink Needlepoint Silk, which is also Chinese silk floss, costs $3.80 for five meters. That’s what I get for “just following instructions.” Maybe it will look more authentic. I sure hope that I conclude when finished that it was worth it! Although I’ve got almost every size of stretcher bars, I didn’t have 17″ ones, so I had to buy them. And, of course, once I was in the shop, I couldn’t resist adding to my stash. I’ve wanted to try Soy Luster, the soy silk thread. That’s the colored threads. I bought white silk ribbon and white #12 Anchor pearl cotton. I’ve never used #12 and wanted to have some to try. If I need a specific color, I’ll dye it. Same with the white ribbon. And you can see the beads. I have lots of colored beads, so that’s why I bought white, silver, ivory, and clear crystal beads. It was great fun being in a physical, rather than virtual, shop, touching and seeing all the threads and stuff. I have decided that having a ready-made design and full instructions should enable me to work for short periods of time on this stitching, while continuing my physics study. Since buying and stitching kits in the 1970s, I don’t think I have ever worked a given design, following all the instructions, using the materials called for. I always like doing things “my way,” and I always think of something else I’d like to try. I’m doing this because it’s an easy, though VERY expensive, way to learn the Elizabethan stitches and a “no thinking required” project I can go to my floor stand to work on when I feel like it. I don’t mean that learning the stitches will be easy (plaited braid stitch???) But when I need a break from studying, I think this will be something to do that doesn’t take much thought. Oh, it is so good to be able to show and tell you about my doings and to share my enthusiasms with you. Such a pleasure! Showing and telling, and knowing I have such good friends out there. Two more books have arrived to add to the pile I’m already tackling. John Wheeler died last year, after a highly distinguished career in physics. David Peat writes about creativity in The Blackwinged Night, including the creativity of nature, the universe. 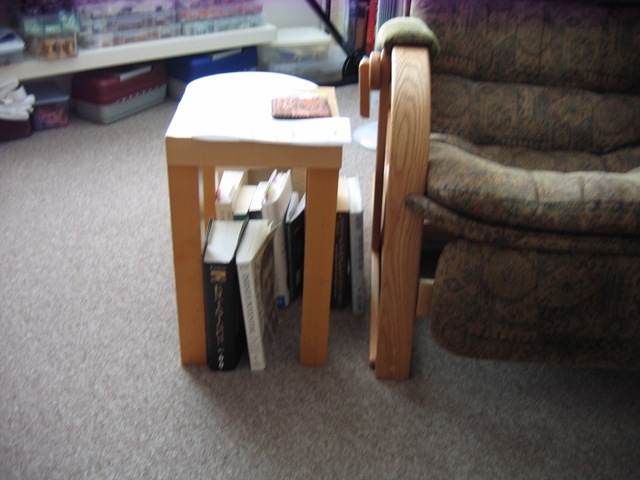 The physics-related books by my reading chair. I’m plugging along, but really, really missing stitching. When I showed you, a little while ago, the books I was using in my study of physics and said that I was taking a time out from stitching and blogging so that I could finish that study and write an essay summarizing what I’d learned, I thought it would take a couple of months or maybe three. Well, I’ve already spent that much time and it’s clear this project is going to take a lot longer than I expected, maybe all this year. The more I read, the more interested I become. 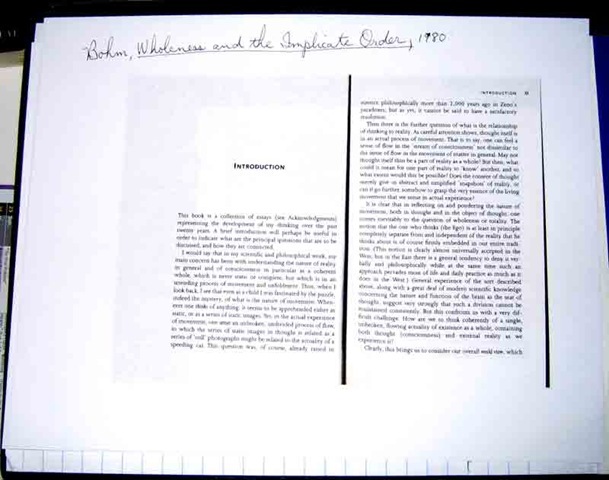 Of course, each book contains references to other scientists and books, and a bibliography. Consequently, my list of books to read is not shrinking, but growing. I failed to mention in that post that I had already read David Bohm’s Wholeness and the Implicate Order. Before sending it back to the library, I photographed pages I wanted to be able to refer to. When I found how long it was taking me to read The Lightness of Being for the second time, I interrupted that book to read the library books so that they could be returned on their due date. As you can see, there are lots more Post-It flags in The Lightness of Being now. Here are the books Ernie took back to the bookmobile this morning. 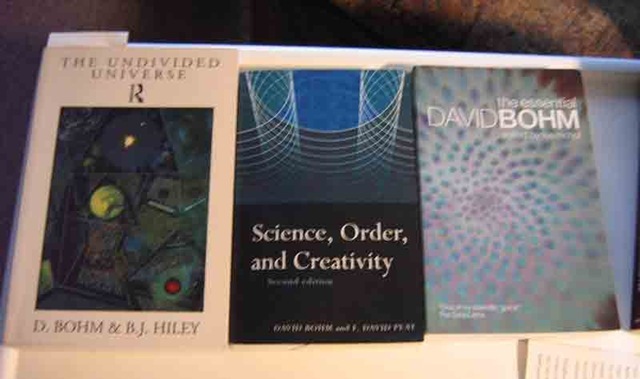 Looking Glass Universe and Turbulent Mirror, both written by John Briggs and David Peat who are PhD physicists, are about new research and theories not only in physics, but in chemistry, biology, neuroscience, and consciousness studies, especially related to chaos theory and wholeness theory. Having decided I needed to have these books for reference, I’ve already ordered them online, very cheap. 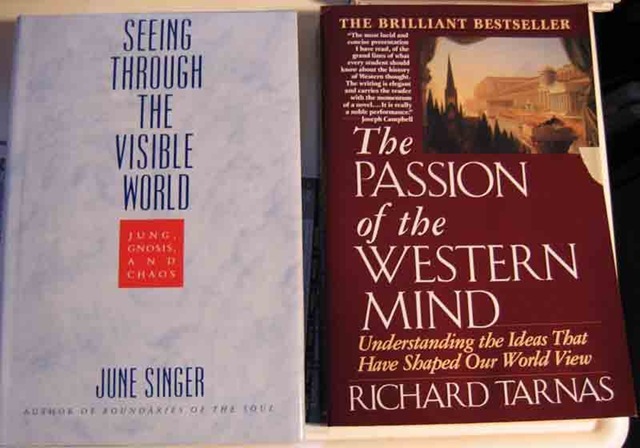 These books sent me to my bookshelves to review June Singer’s chapter on chaos theory and Richard Tarnas’s brilliant history of how the Western worldview has been shaped through history to become what it is today, and of course science is a huge influence on Western thinking and culture. I continue to review lectures from The Teaching Company course. 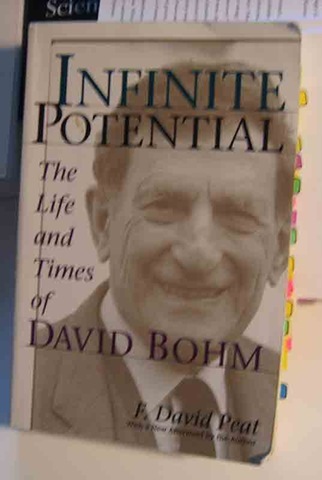 And I have a lot of Post-It flags to return to and copy passages from this biography of David Bohm. I still have these books by Bohm to read, and Ernie should be bringing me two more books I’ve requested from the bookmobile. Since this project is going to take so long, I will take breaks for stitching and blogging. I think all the to-do I made over finishing the S patchwork block was because it was such a pleasure to have fabric, needle and thread in my hands again. Same with blogging. I don’t want to drop this blog for months ahead. Right now I’m in a state of confusion, overwhelmed by the reading I’ve done so far. Not only books, but online as well. I’ve looked up terms and theories for other explanations. Almost all the books I have were published in the 1970s, ‘80s, and 90’s, so they do not include the most recent work in physics. I go online to find out what the current thinking is about the theories, the research, and the physicists who wrote these books. Metaphorically, I’ve learned to recognize a lot of different trees, but I’m lost deep in the forest. I can’t even imagine how I’ll be able to write about what I’ve learned and what I think about it all. It may turn out to be impossible for me to write a coherent summary, explaining to myself what I know and what I believe about modern physics and other sciences. For the next few weeks or maybe longer, I will be posting either very little or not at all. The reason for this time-out is so that I can focus on learning about and thinking about modern physics. An English major, I’ve always had some interest in science. I first became interested in physics about 20 years ago or more, when I read two books about the correlations between quantum mechanics and the insights of Eastern philosophers, but I didn’t have time to really learn anything about it. The next time I got interested in quantum mechanics was in 1996 when granddaughter Melissa graduated high school, intending to major in physics in college. By then, I was living in seclusion in West Virginia, trying to figure out what was wrong with me. We gave her a leather back-pack and a bunch of physics books–popular science, not text books. I told her that even if she didn’t read them, she could put them on her dorm bookshelf and look really smart. Before sending them off to her, since I had plenty of time, I read all of them and wrote a paragraph about each for her. But I still didn’t remember or understand much of what I had read. 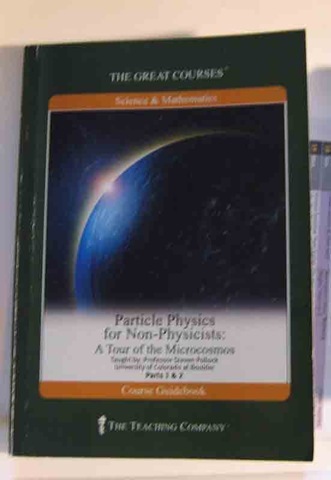 The next time I got really interested in physics was earlier this year when The Teaching Company offered me big discounts (15% in addition to their usual discount on selective courses) on their Particle Physics for Non-Physicists course, as well as String Theory. Irresistible. I bought both courses. This time I wanted to learn as much as I could. That grandson Matt is a physics major, now applying to graduate schools, was further motivation. Two weeks ago he sent me his proposal for his senior physics project, “Nanometer Optical Imaging of Fluorescent Dyes” and I spent three days reading and re-reading it, looking up a lot of terms online, until I could write back to him my summary of his proposal. The more I read about quantum theory and what physicists are doing now, the more fascinated I become and the more I want to understand as much as I can. Given my limitations, I can’t stitch and study at the same time. As I wrote in my last post, it’s no good if I don’t focus entirely on my stitching, if I also have something else on my mind. Since I intend this blog to be mainly, though not exclusively, about “my life in stitches,” I won’t have much to blog about while I’m not stitching. Besides, I want the blogging time for studying. I misquoted the title of a book I referred to in the video. The correct title is The Unbearable Lightness of Being, by Milan Kundera. In this video I show and tell you about the books I’m reading. You can see a video interview with David Bohm on YouTube. His radical theory of an order underlying the quantum world that explains the gaps and mysteries of quantum theory has not been accepted by mainstream physicists. As with other BIG new ideas in science, it may take a long time for other scientists to grok to it. Since it cannot be experimentally proved or disproved, now at least, there’s no way of knowing its validity. The same is true of string theory, another attempt to explain what’s missing in quantum theory. I have The Teaching Company course on string theory, which is purely mathematics, and equally unproven and suspect by mainstream physicists. Physics is about what you can measure. The reality of the universe may not be measureable. Wasn’t there once a popular song with the line, “I’ve gone about as far as I can go”? That may be where physics is in the 21st century. But some physicists thought that physics was done at the end of the 19th century, before Planck, Einstein, et.al. The 20th century was truly the age of physics, with incredible money made available for experimentation, which, of course, brought us atomic weaponry, as well as x-rays, computers, television, cell phones, and on and on. Now that the Large Hadron Collider is in operation in Europe, where physicists expect to find a theoretical particle/field called the Higgs boson, they hope it will explain dark energy and dark matter, which comprise 95% of the universe. The LHC is expected to provide answers to other theories, as well. So maybe physics isn’t done. We’ll see. It’s an exciting time. But I’m still drawn, strongly drawn, to Bohm’s ideas of wholeness, that the universe is truly One, and all things, everything, is interconnected. Well, I’m going to wrap up here so that I have more time for reading those books. I feel compelled to understand as much as I can. I want to have enough of a background in the state of modern physics to be able to read David Bohm’s intriguing theories with critical understanding. I intend to stay away from the Internet as much as I can during this time, but I’ll be back, and I hope you’ll stop by next year when I start stitching and posting again.